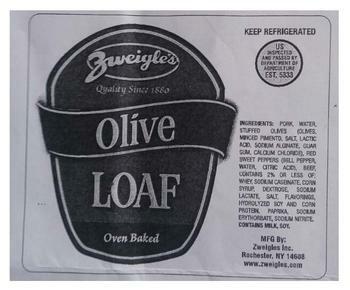 Zweigle’s of Rochester, N.Y., is recalling approximately 6,082 pounds of ready-to-eat olive loaf pork products. The products contain sodium nitrite levels in excess of the regulatory limit. Approximate 9-lb. boxes containing two-half loaves of “Olive LOAF Oven Baked” with “Use By” dates of 8/22/18, 9/12/18, 9/19/18, 10/4/18 and 10/17/18 and case code 070534075225. The recalled products, bearing establishment number “EST. 5333” inside the USDA mark of inspection, were shipped to retail locations in western New York as intact loaves for slicing. Consumers with questions about the recall may contact Derek Annechino at (585) 546-1740, Ext 36.